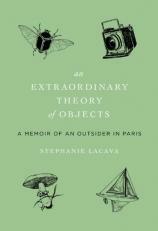 An awkward, curious girl growing up in a foreign country, Stephanie LaCava finds solace and security in strange and beautiful objects. When her father's mysterious job transports her and her family to the Parisian suburb of Le Vesinet, the young American embarks on a life of discovery. Tasting the enchantments of Paris, she makes friends with her peers at a wildly unconventional international school and faces terrorism. But Stephanie's wonder gives way to anxiety and a deep depression brought on by a series of circumstances. Through her darkest moments, Stephanie continues to filter the world through her peculiar lens, discovering the strange beauty surrounding her. The grotesque (beetles and catacombs), the natural (mushrooms and lilies of the valley), the cultural (Nirvana and other nineties touchstones), and the historical (Nancy Cunard, Jean Seberg), all become unique talismans. Encouraged by her father through trips to museums and scavenger hunts in antique shows, she traces an interconnected web of stories of past outsiders, historical and natural objects, and her present predicament that ultimately helps her survive when she feels she's losing control.